Taylor is one of twenty-five elite makers in the world invited to display at the AKI every other year in San Diego. Ron Skaggs is unquestionably the finest engraver doing bas relief work today, and Taylor has taken thirty years to get where he is, at the top of the heap. Investment grade quality here. The handle has Antique Tortoise Shell interframes with 14K Gold pins, bas relief birds and Eros surrounds by Skaggs. 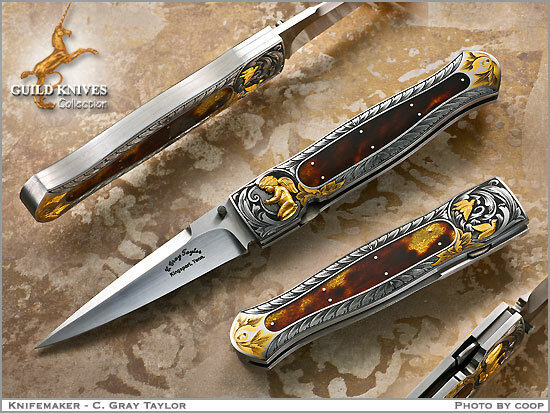 See this knife on C Gray Taylor's web site. Piles of Skaggsâ€™s carved Gold all over the place. It would have been Oscar Wildeâ€™s favorite carry knife.